This large, charming and highly collectible Green Multicolor Onyx Gemstone Egg was mined, carved and richly polished by hand to a high gloss finish in Pakistan � the home of the highest quality and most beautiful Green Multicolor Onyx in the world. Sought after by both beginning and serious gemstone egg collectors and home decorators alike, it is an excellent example of this how this lovely translucent, semi-precious gemstone grows within Mother Earth. 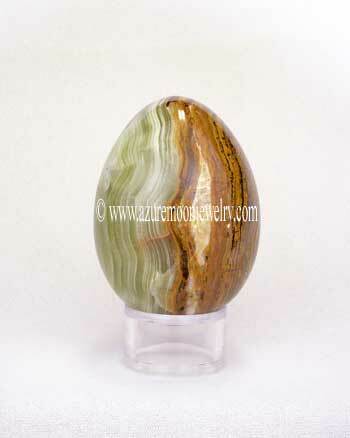 The beautiful, mesmerizing and natural patterns of pale green Onyx, with rust colored veining and white banding on one side and whirling, banded colors of light to medium shades of brown on the other side, with a band and window of Clear Crystal Quartz in between make this marvelous Green Multicolor Onyx Gemstone Egg truly one of a kind (we purposely photographed this egg this way in order to show both sides). It will certainly make an impressive and beautiful addition to any new or existing gemstone egg collection, a wonderful Easter, or spring time display, as well as a thoughtful and sure to be treasured unique gift! And remember - gemstone eggs are perfect for use in crystal healing, chakra therapy, meditation and therapeutic massage too! 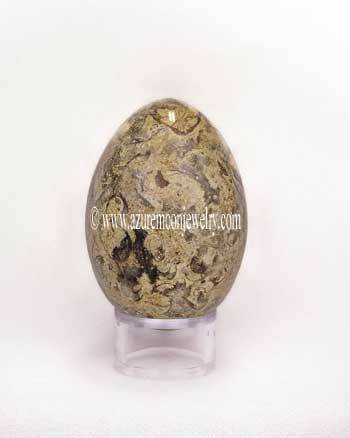 This Green Multicolor Onyx Gemstone Egg is the size of a duck's egg and measures approximately 2 3/4� L - 2� W and weighs 254 grams or 1270 carats. The crystal clear acrylic display stand is included.